A pre-cleansing oil that breaks down make up and impurities effortlessly while leaving skin hydrated and glowing. Named after the ketogenic diet, this oil cleanser is essential oil free and contains active ingredients like MCT oil, ghee and coconut oil to effectively clarify your complexion without leaving behind any oily residue. The lauric acid in coconut oil also helps to fight topical bacteria, viruses and fungi. Unlike other cleansers, this pre-cleanse doesn’t strip oil from the skin, leading to increase oil production and potential breakouts. Rather, it maintains your skin’s natural PH balance while providing a protective moisture barrier for fresh, hydrated, skin. 3. You can incorporate the same kind of movements you use when using a normal cleanser. However, this cleansing massage should take about two to three minutes if possible, so really take the time to massage the oil in across the face. Using oil to massage your skin ALSO helps promote blood circulation and lymph drainage, reduces the appearance of fine lines and wrinkles, softens pores to help decongest the skin and is also incredibly relaxing. 4. Wet a washcloth or ideally your Bamboo Charcoal Sponge with hot water (you want it to be steamy and warm, but not scalding) and press it against your face. Hold it against your face for a minute, to steam and activate the oils. Breathe deep, then buff away thoroughly. 6. It does take some getting used to but if you are doing it right, your skin WILL be soooo happy! Give it a try. Your face will thank you. *Note: Due to the natural of Keto Cleanse's all natural products you might find that it will slightly solidify when the bottle gets cold. This is normal. Simply run the bottle under warm water or place it (with the cap on) for a few moments and it would restore back to its original state. Ingredients: caprylic/capric triglyceride (MCT) oil, cocos nucifera (coconut) oil, butyrum (ghee) and nothing else! 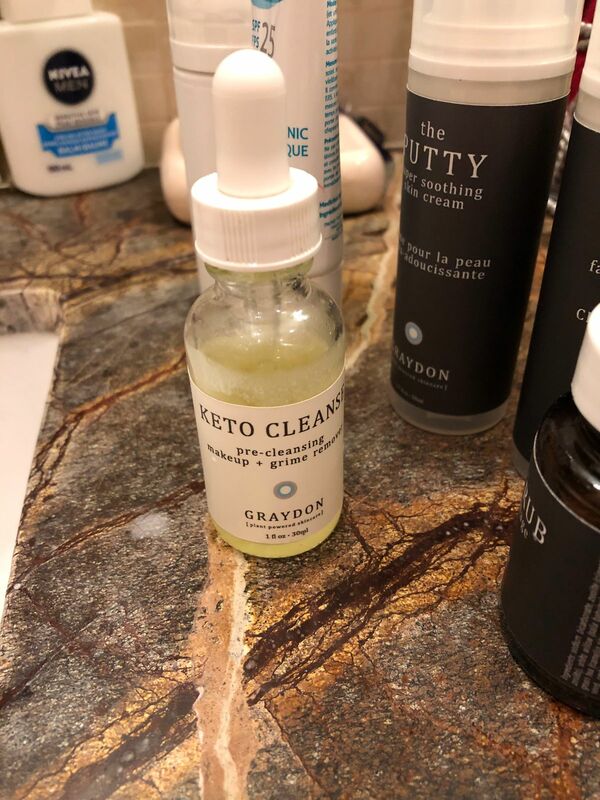 Hi Alexandra, the Keto Cleanse is great at attracting make up and grime. It also works great with our Bamboo Charcoal Sponge as well for an all over deep clean!